Hello, remember me? 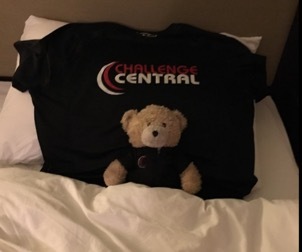 I am Cedric the Challenge Central mascot. At just over 4 years old, here is a picture of my debut to this world. 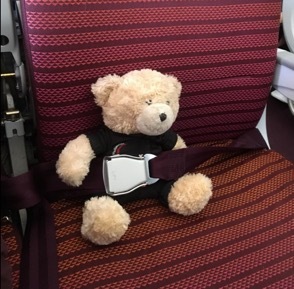 …but the latest trip I want to tell you about is the Thailand, Bangkok to Phuket cycle, what a fantastic adventure that was, they called it a Challenge, but for me it was a fun adventure. First, I replaced my hiking gear with a new, well cool, cycle top and pucka cycle shorts. Here is a picture of me showing off my new gear. 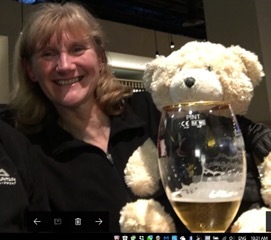 So we packed our bags and headed off to Heathrow, in time for a quick beer before boarding. 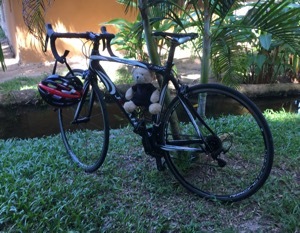 After a quick pose, at our idyllic lodgings just outside Bangkok, we were ready to head off for the cycle adventure of a lifetime. 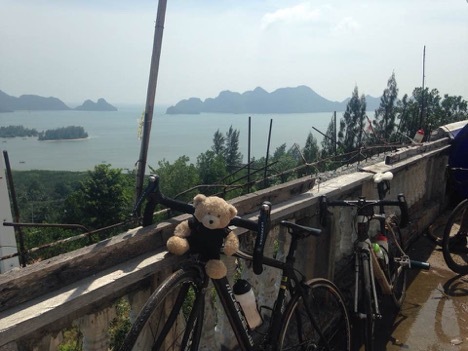 “We” cycled down the east coast of Thailand for a few days, a day’s rest in a holiday resort, then a day to cross over to the west and a couple of days down the west coast to Phuket, and that was it, job done!! 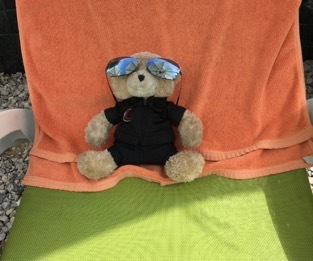 The weather was great, although we expected it to be hot and humid, even for me with my furry coat it was absolutely bearable (excuse my bear joke!!). Most days sunny and warm but OK with appropriate head gear and my special teddy factor 30, some overcast but still warm, and even where it rained all day it was still warm. I have to mention food, I love it, the Thai food was delicious. A fabulous little man they called Tik, also a cycle guide, was the food expert and he took us to great places for lunch and dinner and chose some wonderful dishes for us. The roads were great and as good if not better than any I have travelled on in Europe, especially well catered for with cycle paths on the highways better than you would find in UK. There were stunning views of Thailand throughout the trip. Lots of photos of the Challenge Central cycle group and the local leaders, so go on to the CC website and read the human blogs and see their photos, but this story is about ME, so here is a photo I have with me in it to show the sort of views I got to see from the front of the bike. All the cyclists did well and all completed the cycle. There were some great characters on the trip and I enjoyed meeting them all. There was one old boy there, must have been at least 62 years old, he kept going on and on about how he hadn’t cycled this far since he was a teenager, and had done some training this year but most of it on a Wattbike, whatever that is, but he looked comfortable and completed without trouble. The two lovely ladies were great, and had no trouble showing most of the boys the way up the steepest of the hills. 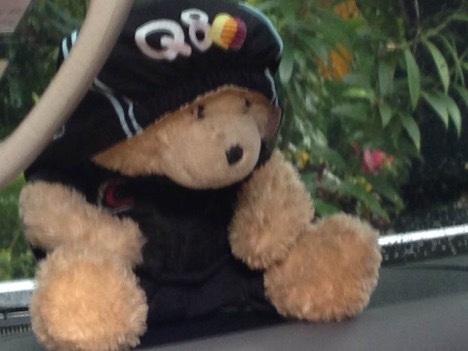 On the one day where it rained all day, I stayed in the support van and met the man they called Wow. What a great name and what a great bloke. He gave me his hat to wear for the day and took a picture of me. 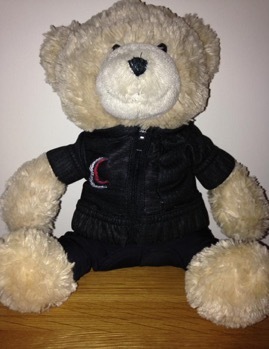 If there is re-incarnation for teddy bears, I want to come back as a Wow or Tik !! 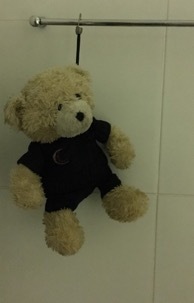 Not very dignified, they hung me out to dry after we got caught in a sudden downpour. Then they quickly had to post this one to show I hadn’t hung myself in the last one. Me chilling in Krabbi for a few days after completing the cycle. 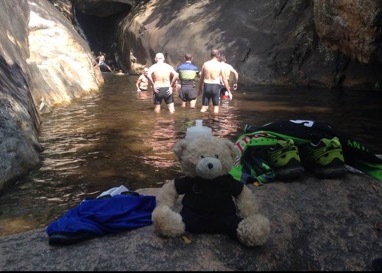 On a hot day, they all went for a cool down in a stream and left me on a rock!